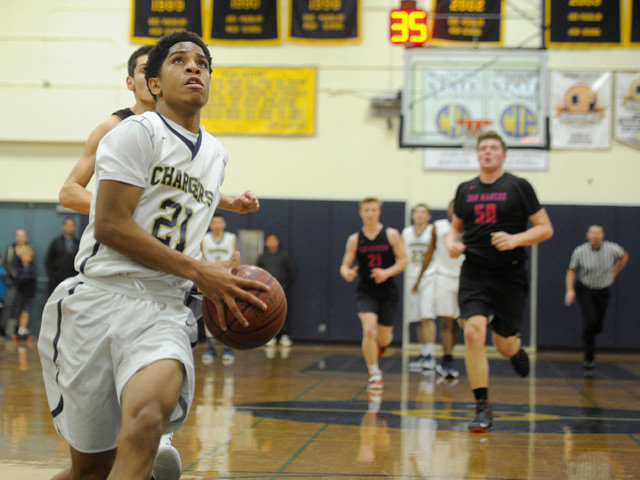 Look who’s riding high in area high school basketball after winning a game in the most charged-up atmosphere of the season: the Dos Pueblos Chargers. <b>CHARGER COUNTRY:</b> Marcellous Gossett (20) puts the ball off the glass over San Marcos center Jackson Stormo during a showdown that packed the Dos Pueblos gym. 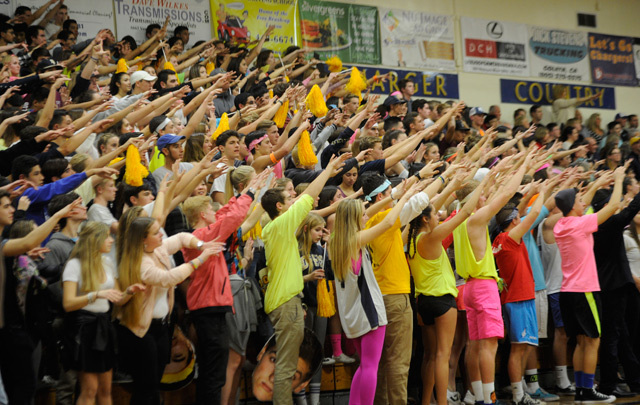 DP’s Sovine Gym was packed by students and fans who had seen the Chargers end their drought in the Channel League — 1-7 records each of the last two years — but to go from last place all the way to first, they needed a downpour. It came in the third quarter, when Dos Pueblos scored 30 points to overcome the Royals’ 27-20 halftime lead. Diego Riker’s fourth three-point bucket of the period put the Chargers ahead 50-47 entering the fourth. San Marcos rallied back with a flurry of three-pointers by junior guard Ryan Godges, who tied the score at 58-58. Cyrus Wallace put the Chargers back ahead with a pair of free throws, and Marcellous Gossett expanded the lead to 63-59 with an explosive offensive rebound and putback. After Stefan Korfas of San Marcos made a short jumper with 17 seconds remaining, Shugart and Wallace secured DP’s triumph at the free-throw stripe. With its second victory over the Goleta Valley rivals, Dos Pueblos (5-0 in the Channel League, 18-3 overall) padded its lead over San Marcos (3-2, 17-7) and four-time defending champion Santa Barbara (2-2, 13-10). The Chargers have a clear path to the title with three league games remaining: tonight (Thu., Feb. 2) against Ventura; February 7 at Santa Barbara; and February 9 at Buena. The Chargers are a seasoned squad, with four senior starters — Shugart, Riker, Gossett, and Thomas Jimenez. Riker (20 points) was the leading scorer Friday, while backcourt mate Shugart scored 14. Wallace, a junior, contributed 10 points. He, Gossett, and Jimenez — all 6′3″ — contended with the Royals’ 6′8″ junior center, Jackson Stormo. Stormo played all but a minute or two of Friday’s fast-paced game. “I built up my stamina for a game like this,” he said. It was a night of such intensity that the Royals’ young coach Landon Boucher said he was wrung out just standing on the sideline. The area’s teams will be slotted into different divisions in the upcoming CIF Southern Section playoffs. Santa Barbara, based on its success in recent years, is in the high-powered Division 1AA; San Marcos is ranked No. 10 in 2AA; and Dos Pueblos is No. 8 in 2A. 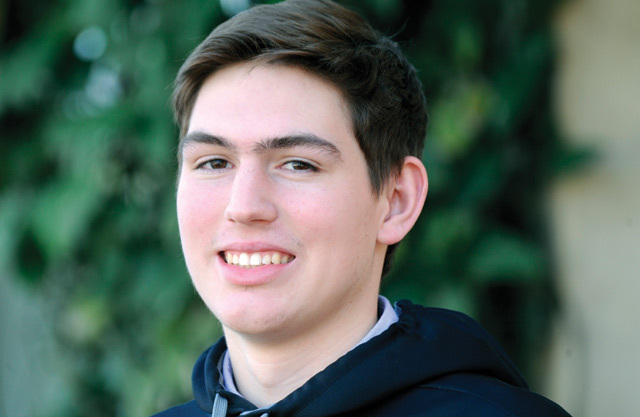 Two leading men on area prep courts last year — Santa Barbara’s Bolden Brace and San Marcos’s Scott Everman — are seeing significant playing time as college freshman, Brace at Northeastern University, and Everman at UC San Diego. Bishop Diego’s boys, who hold second place in the Tri-Valley League, are in CIF Division 4A. The Cardinals play at rival Carpinteria on Friday, February 3. GIRLS’ HOOPS: Dos Pueblos, 19-3 and ranked No. 4 in Division 2AA, will play at home against Channel League superpower Ventura (No. 8 in 1AA) on Friday night. The Chargers, 3-2 in the league, will visit Santa Barbara on Monday, February 6, in a game likely to decide second place. 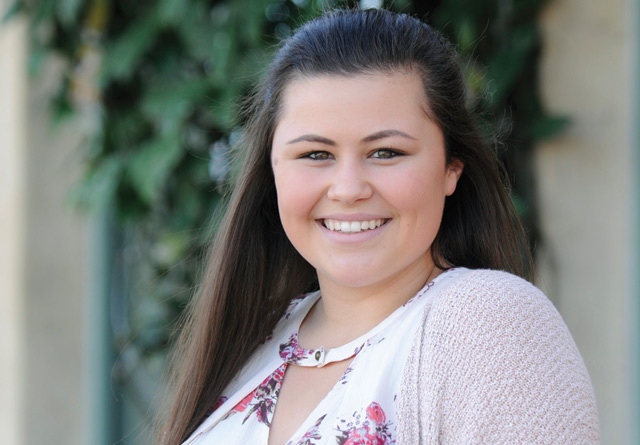 OLYMPIC WOMEN: The Santa Barbara Athletic Round Table strives to bring dynamic athletes to the podium at its annual Women & Girls in Sports Luncheon. It did not have to search far and wide this year. Sami Hill and Barbara Nwaba, two of America’s finest at the Rio Olympics, are hometown women. Hill, a 2010 graduate of Dos Pueblos High, was a goalkeeper for the gold-medal-winning U.S. water polo team. Nwaba, a 2012 graduate of UCSB and member of the Santa Barbara Track Club, is the U.S. heptathlon champion who finished 12th at the Olympics against the world’s best all-around female track-and-field athletes. The special luncheon will take place Monday, February 6, at 11:30 a.m. at the Earl Warren Showgrounds. Reservations should be made by Thursday. For more info, visit sbart.org. RETIREMENTS: Two-time Olympic decathlon champion Ashton Eaton and his wife, heptathlon bronze medalist Brianne Theisen-Eaton, jointly announced they are retiring from international athletics. The pair had trained every April for five years at Westmont College. Former Dos Pueblos basketball star Julyan Stone is still playing, but the No. 2 he wore with the Chargers was retired Friday. Stone is on the Indiana Pacers’ D-League team, the Fort Wayne Mad Ants. 2/4: College Basketball: UC Davis at UCSB It’s a day-night double-header. Coach Bonnie Henrickson hopes for a supportive home crowd when the UCSB women take on the visiting Aggies in a pivotal Big West game. Both teams entered the week a game out of first place. The Gauchos are coming off an 85-60 victory at UC Irvine in which freshman guard Aliceah Hernandez made seven three-pointers. In the men’s game, a depleted UCSB team will try to play spoiler against the first-place Aggies. A ticket to either game Saturday will be good for general admission to the other game. Women: 2pm; Men: 7pm. The Thunderdome, UCSB. $8-$14. Call 893-UCSB (8272) or visit ucsbgauchos.com. 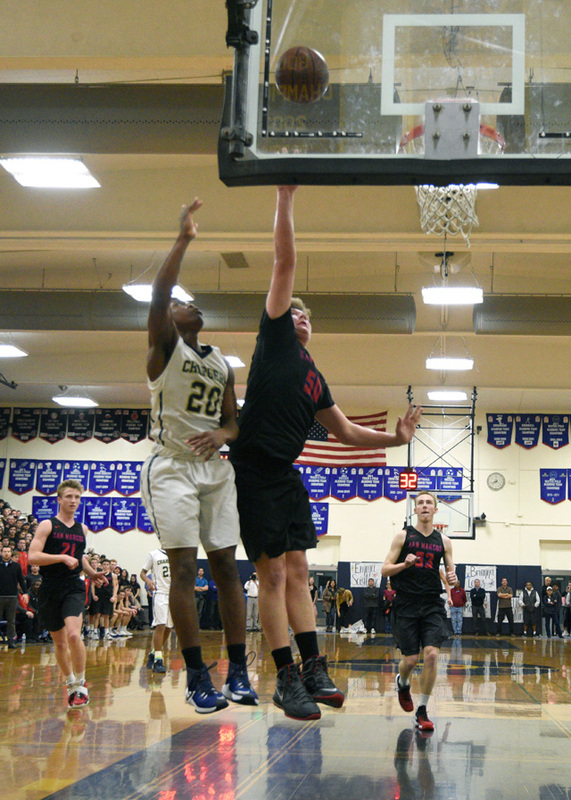 The senior led the Cardinals to three wins last week, scoring 23, 16, and 30 points, moving them into second place in the Tri-Valley League. In three victories by the Cardinal girls, the senior averaged 13.7 points, including a double-double (12 points, 10 rebounds) against Villanova.